Nicaragua has been a good example of how Western corporate and alternative news media are able to create a custom-made bizarro-world to suit the propaganda requirements of their countries’ elites. The current media onslaught against Nicaragua uses the whole toolbox of propaganda tricks portraying aggressors as victims, reporting non-existent massacres of peacefully protesting students, denying systematic destruction by opposition paramilitaries of public property and private businesses, even omitting attacks on hospitals and ambulances. The big fundamental fiction has been that a majority of people in Nicaragua reject the Sandinista government led by President Daniel Ortega. The converse of the lie is that most people support the so-called Civic Alliance composed of right-wing business leaders, right-wing political parties, reactionary Catholic bishops, U.S.-funded NGOs and university students allied to those interests. But events in real life contradict the minority opposition storyline. On April 22nd, the supposed dictatorship proposed a national dialogue mediated by the Catholic church. It took the opposition almost three weeks to agree. They did so on condition the government withdraw the police from the streets. In fact, police had already been ordered not to intervene against the violent opposition paramilitaries. The government agreed, but when the dialogue began the bishops refused to condemn opposition violence while still falsely accusing the government of violent repression. The opposition never tried to negotiate in good faith, simply demanding the government resign and refusing to dismantle roadblocks which the government, supposedly a dictatorship, allowed to operate so as to avoid more violent conflict. The government strategy has been to accept extraordinary levels of opposition violence and intimidation so as to allow the opposition to discredit themselves with public opinion. The opposition violence and roadblocks have disrupted economic life, affecting thousands of small and micro businesses, throwing tens of thousands into unemployment and causing hardship for many thousands of people with serious health problems. The opposition paramilitary violence has destroyed numerous public buildings and government offices in various cities, decimated the tourist industry, cost the lives of around 150 people and left over 1100 injured. Some of the worst violence has been in the tourist cities of Granada and Masaya where hundreds of businesses have been practically destroyed. In that context, the Catholic bishops categorically betrayed their mediation role last week by presenting President Ortega with an undisclosed ultimatum very obviously in sympathy with the political opposition and demanding a response in two days. Following that ultimatum delivered on June 7th, the opposition paramilitaries staged a wave of attacks against government offices in León, Masaya and Jinotega, also attacking police stations elsewhere to steal firearms, kidnapping and torturing police officers. In an attack on Monday, June 11th, a gang of paramilitaries killed two more police officers, wounding two in Mulukukú in the country’s northern Mining Triangle. At the same time, they intensified their roadblocks almost completely stopping traffic along the highway between Managua and the north of the country. That same day, police acted to clear some of the roadblocks in what many people view as the beginning of President Ortega’s response to the bishops’ ultimatum. The government decision to act against the roadblocks strangling the economy is clearly supported by a majority of people in the country. But it remains to be seen how the opposition will react. One feature in particular of the crisis covered up by alternative and corporate media has been the role in the opposition violence of organized crime and delinquents. From the very start of the crisis on April 18th criminals and youth gangs have operated alongside right-wing extremists to foment civil disturbances and lethal violence. One notorious group involved in attacks portrayed as political protest and also responsible for various murders, including one of a U.S. citizen, was broken up by police on May 31st. The group operated out of the private Polytechnic University occupied by opposition students and associated protestors, including this group of criminals The police have accused right-wing political activist Felix Maradiaga of involvement with that criminal group. Maradiaga, one of the leaders of the opposition protests against the government is currently in the United States where he went to lobby against the Nicaraguan government in the Organization of American States General Assembly on June 4th and 5th. During that OAS General Assembly, Nicaragua’s diplomats defeated opposition efforts to secure any condemnation of President Ortega’s government. Secretary-General Luis Almagro had previously denounced deceitful and misleading statements from Nicaragua’s opposition, insisting on a constitutional resolution of the country’s crisis. That lead Felix Maradiaga to accuse Almagro of being President Ortega’s accomplice, to which Almagro retorted that he is indeed an accomplice, but an accomplice of democracy against anti-democratic moves in violation of constitutional norms. Subsequently, the United Nations Secretary-General expressed his satisfaction that the Nicaraguan government is working closely with the OAS to reach a negotiated settlement to Nicaragua’s political crisis, a position supported by the European Union and, at least nominally, even by the U.S. State Department. These setbacks at the international level for Nicaragua’s political opposition have been followed by the collapse of the Catholic bishops’ credibility as mediators for the dialogue and the emergence of clear majority support nationally for an end to the violence and the economic damage and distress it has caused. In this new context, Nicaragua’s Sandinista government seems to be moving cautiously to clear the roadblocks while at the same time developing local initiatives for peace and dialogue aimed at isolating the violent opposition paramilitary groups. As that process advances, Nicaragua’s political opposition are likely to act with increasing desperation to try and mitigate the likely consequences of their attempted coup. 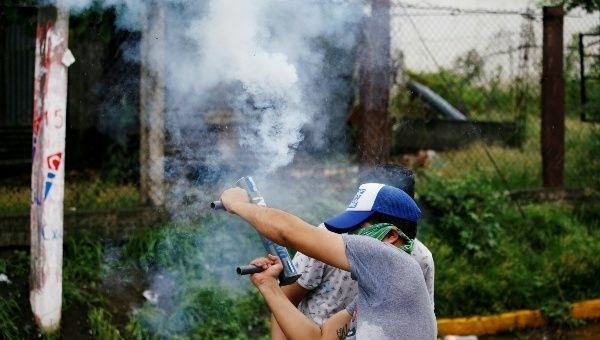 While the next couple of weeks may well see the beginnings of a political settlement of the crisis, achieving that outcome is likely to come at the price of yet more death and destruction from Nicaragua’s opposition extremists. The Blockade: what happens if it continues?